This June’s BJHS contains a pair of articles on natural history cabinets. Kit Heintzman’s Singer-winning essay ‘A cabinet of the ordinary’ discusses the collections of the Ecole vétérinaire d’Alfort and the construction of veterinary science as a matter of domestic animals. Also located in the eighteenth century, Edwin Rose’s essay ‘Specimens, slips and systems’ reconstructs the flexible taxonomic systems embodied at the world’s first public museum. Turning back to the seventeenth century, Michael Neuss offers a daring new reading of William Harvey’s De motu cordis as an exercise in accounting in ‘Blood Money’. A final pair of papers tackles, in different ways, the construction of selfhood through science. Fenneke Sysling’s ‘Science and self-assessment’ examines how phrenological charts enabled clients actively to participate in the creation of self-knowledge, while Sebastián Gil-Riaño, in ‘Re-locating Antiracist Science’, argues that the UNESCO Statement on Race offered a rationale for scientific elites to intervene in the ways of life of those they deemed ‘primitive’. Image: Two plates attributed to specimens held at Alfort. The left is a representational drawing of a live llama standing in its habitat. The right is the internal anatomy of a dolphin, including skeleton and organs. 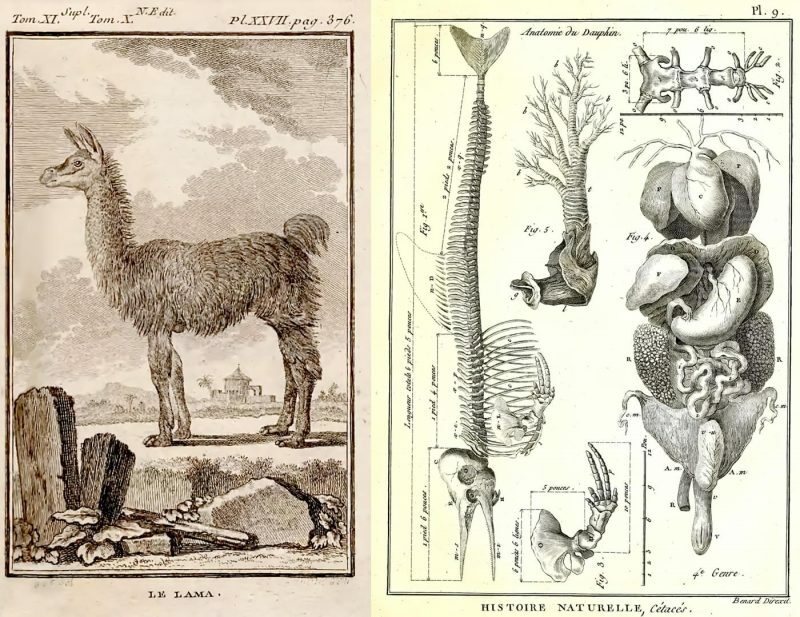 The llama lived in Alfort’s menagerie and the skeleton came from Alfort’s cabinet. Left: Georges-Louis Leclerc, Comte de Buffon, Oeuvres complètes de M. le Comte de Buffon, vol. 10, Paris: Imprimerie royale, 1775, Planche XXVII; right; [Piere Joseph] Bonnaterre, Tableau encyclopédique et méthodique des trois règnes de la nature: Cétalogie, Paris: Panckoucke, 1789, Planche IX. Images retrieved from the Biodiversity Heritage Library (www.biodiversitylibrary.org), used with permission.